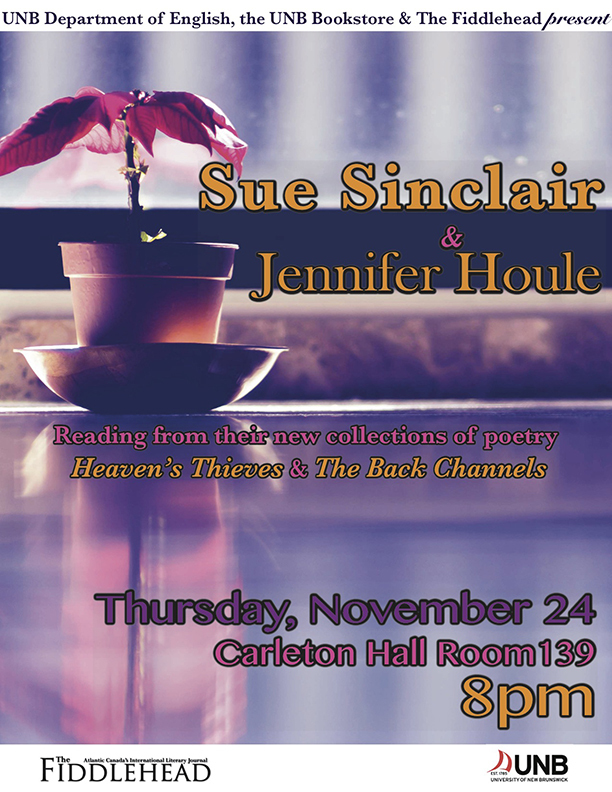 Sue Sinclair and Jennifer Houle will be reading from their new collections of poetry Heaven’s Thieves and The Back Channels this Thursday, November 24th at 8pm in Carleton Hall room 139 on the UNB campus. The event is free to the public and all are welcome to attend. Dr. Sue Sinclair is a professor of English at UNB Fredericton. Having obtained her Bachelor’s degree at Mount Allison University, she continued her education in New Brunswick at UNB Fredericton where she completed her Masters in Creative Writing. Sinclair also has an MA in Philosophy, as well as a PhD in Philosophy, both of which were completed at the University of Toronto. Her latest collection of poems is Heaven’s Thieves (2016) from Brick Books. Heaven’s Thieves features lyric poems that explore philosophy, ecology, and experience. Sinclair refuses to shy away from existential questions in this collection; the poetry of Heaven’s Thieves is fearless, investigative, and soulful. Atlantic Poetry Prize as well. 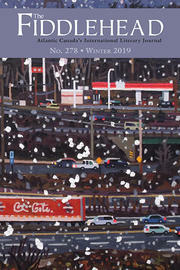 The Drunken Lovely Bird (2004) won the American Independent Publisher’s Poetry Prize, and Mortal Arguments (2003) was a Globe and Mail “Top 100” book. Jennifer Houle grew up in Shediac, New Brunswick. She completed her Masters in Creative Writing at UNB Fredericton. An East Coaster through and through, she now lives in Hanwell with her husband and two sons. This event is presented by the UNB Department of English, the UNB Bookstore, and The Fiddlehead.